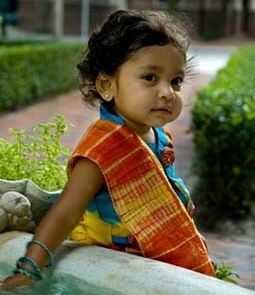 Hindu baby names are derived from traditional Indian religion and mythology. There are hundreds of deities and mythological figures in the Hindu religious pantheism. We shall look at some of the names derived from these myths that are currently popular in naming babies in India. Abhay means “fearless” and was the name of a son of Dharma, one of the greater Indian deities. Abhijit is the name of a celestial body and this popular boy’s name means “victorious”. Aditya means “the sun” which also holds a place in Hindu creationist mythology. Amitabh meaning “with endless splendor” and was a name of Buddha. Anil meaning “innocent” was a god of wind. Arjun was one of the Pandavas from the Mahabharata myth and his name means “peacock”. Balaji and Chakrapani are names for the Hindu deity Vishnu. Balakrishna and Balarama merely mean “young Krishna” and “young Rama” and these two were supposed to be avatars of Hindu deities. Dilip is supposed to be an ancestor king of Rama and his name means “protector of Delhi”. Gopal and Govinda are alternate names for Krishna and mean “cow herder”. Hari meaning “monkey” and is an alternate for Vishnu and Harish meaning “king of monkeys” for Shiva. Kapil meaning “innocent” is another name for Shiva. Kanhai, Kanhaiya, Keshav, Kishan, and Madhav are alternates for Krishna which means “dark skinned”. Lakshman was Rama’s brother from Ramayana and his name means “prosperous”. Rajnish, Rakesh, and Rajnikant are names for the moon which is considered the lord of the night. Sanjay meaning “victory” is another name for Shiva. Aditi is a popular girl’s name meaning “the earth” which also features in the Hindu creationist myth. Ambuja means “born from a lotus” as the lotus is a sacred flower in Hindu mythology. Anjali means “devotional offering with both hands” and Archana and Aradhana mean “worship”. Chandika is another name for the vengeful Hindu deity Durga who is also known by some Hindus as Kali. Durga means “invincible” whereas the word Kali which literally means “black” has come to symbolize the irresistible force of time. Ganga is a popular girl’s name as well as the name of a sacred river in India. Gauri is another name for the female deity Parvathi and it means “fair complexioned”. Gautami is named after the river Godavari and Geeta for the Hindu sacred text Bhagavadgita. Indira is an alternate name for Lakshmi the goddess of “wealth”. Padma meaning “lotus” is also another name for Lakshmi. Radha meaning “success” was the name of Krishna’s wife in Hindu myth. Tulsi is a sacred plant and is supposed to be a manifestation of Devi. Uma means “tranquility” and is an alternate of the female deity Parvathi, wife of Shiva and gentler face of Durga. Urmila, wife of Lakshman, means “waves of passion”. Yamuna or Jamna is the name of another sacred river in India.